Palestinian Authority leader encourages continued violence at Judaism's holiest site, calls Jewish visitors 'settlers'. Palestinian Authority leader Mahmoud Abbas on Friday encouraged Islamists to continue efforts aimed at preventing Jews from visiting the Temple Mount in Jerusalem, calling on Palestinian Arabs to prevent "settlers" from entering the site using "all means" necessary. His comments came days after Israeli police once again clashed with Muslim extremists protesters violently demonstrating against Jews visiting the Temple Mount, which is Judaism's holiest site and also the location of the Islamic Al Aqsa complex. "It is not enough to say the settlers came, but they must be barred from entering the compound by any means. This is our Aqsa... and they have no right to enter it and desecrate it," Abbas said. The PA president was speaking at a conference in Ramallah after a spate of clashes this week since a Monday confrontation between Palestinian youths and Israeli police. Abbas insisted that "defending Al-Aqsa" was tantamount to defending Jerusalem, which the Palestinians are demanding as the capital of a future state. "Jerusalem is the jewel in the crown and it is the eternal capital of the Palestinian state. Without it, there will not be a state," he said. "It is important for the Palestinians to be united in order to protect Jerusalem," he added. Earlier on Friday, hundreds of Palestinians took to the streets of Gaza in a rally protesting the presence of Jews on the Temple Mount, organized by the Islamist Hamas movement. 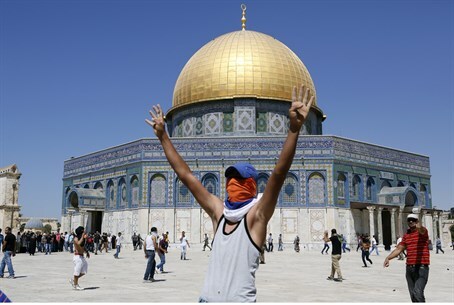 Hamas, along with the Muslim Brotherhood-aligned Israeli Islamic Movement, are believed to be the main forces behind the regular violence at the holy site, with some reports suggesting Islamist activists are being paid to maintain a constant presence there and perpetuate the unrest. In Jerusalem, the weekly Friday prayers at Al-Aqsa mosque passed without incident after Israeli police barred entry to Palestinian men under the age of 50 to prevent disturbances. The Temple Mount is the holiest site in Judaism and the location of the ruins of the two Temples of Jerusalem. The Al Aqsa Mosque and complex are built atop the ruins, and the site is administered by the Islamic Waqf trust. Jews - as well as other non-Muslims, are forbidden from praying or carrying out any religious rituals there, despite numerous court rulings calling for equal prayer rights to be implemented, in a controversial arrangement which Jewish groups have decried as blatantly discriminatory and a capitulation to Islamist threats. Non-Muslim visits to Al-Aqsa complex are severely restricted and regulated by police; those Jews who are suspected of praying are often arrested and expelled from the site. On Monday, Israeli Prime Minister Binyamin Netanyahu reiterated that "Israel is committed to maintaining the status quo" there, but several legislators from the Likud and Jewish Home parties have been attempting to push legislation aimed at enshrining Jewish prayer rights there. Mahmoud Abbas and his Palestinian Authority officially reject the Jewish connection to the Temple Mount - as well as the Western Wall (Kotel) - despite the historic evidence.